Between hay, dry wood, livestock and machinery, farms are filled with hazards that are easily overlooked. 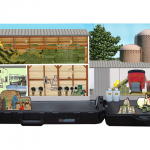 To help educate farm workers on proper fire, electrical and safety measures, a Hazard Farm safety simulator is currently in the last stage of the design and development process. 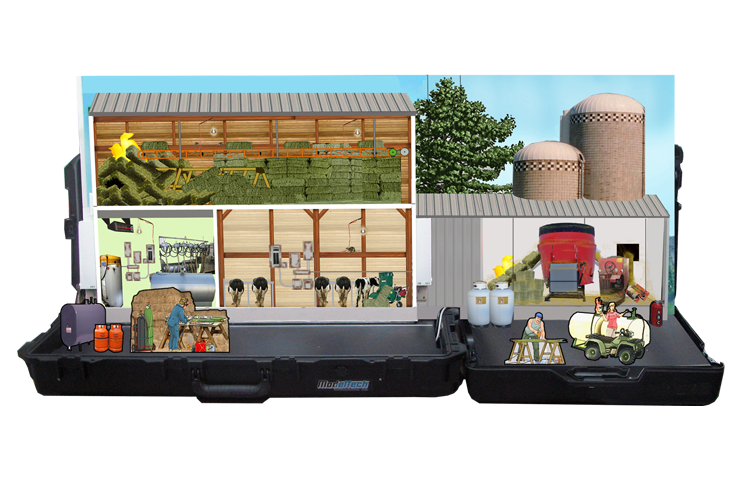 Comprised of two modules – a typical livestock barn and a silo base – the simulator shows numerous fire and electrical hazards: heating devices without heat shields, unsuitable wiring, electrical panels installed near high pressure water systems, overheating of motors and fans… Realistic special effects such as flame, smoke and electrical arcs complement cutouts, 3D parts and flip illustrations in recreating common accident scenes. The two modules will be offered in compact carrying cases, which can be transported as a single unit. The Hazard Farm safety simulator is currently under development. If you’d like to be notified when it becomes available, simply contact us.